When you're searching for data recovery services, there's no better indicator of quality than prior results. Unlike providers that force you to go out on a limb, TTR Data Recovery proves that we can deliver results by maintaining Better Business Bureau approval. 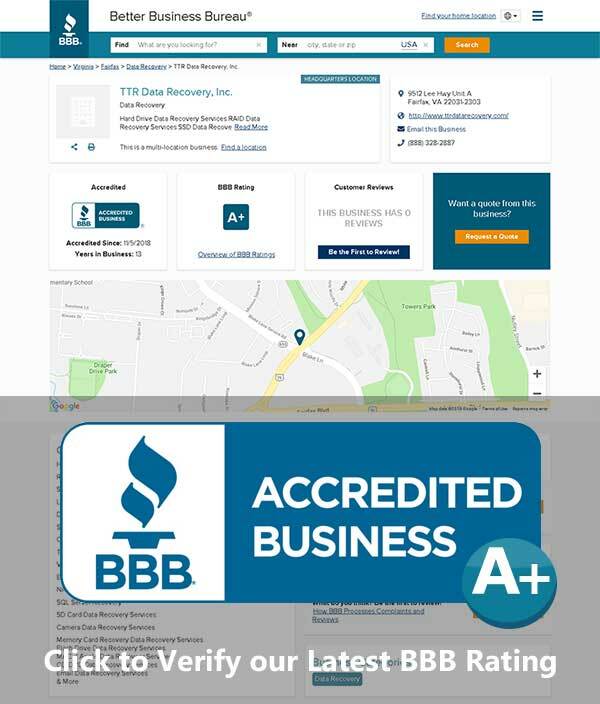 We can’t achieve a higher rating than the current A+ credentials we hold from the BBB, but that doesn’t stop our quest for improvement. Every last member of our team is constantly on the lookout for better ways to put effective data recovery within reach of more businesses. So far, our hard work has paid off, and we’re not the only ones reaping the rewards. How a BBB Rating Is Calculated? It’s easy to see how these benchmarks work together to reflect the high quality of service you can expect from TTR Data Recovery. Bearing A+ accreditation means that we’ve scored at least 97 out of 100 points on the combined BBB scale that evaluates these criteria. Our intensive focus on impactful, comprehensive customer service has clearly impressed real-world clients enough for them to report great things. One notable aspect of our BBB rating is that we’re not directly involved in its calculation or modification. While businesses are permitted to dispute complaints and use the BBB resolution system, we’ve discovered we generate far better results by concentrating on the work we perform instead. TTR Data Recovery clients can always exercise their right to anonymously report our achievements or deficiencies to the BBB as they see fit. As a result, our A+ rating stands as a testament to what people really think about our performance. Of course, every one of our clients has their own unique reasons for soliciting our data recovery offerings. That’s why we work to fulfill a diverse array of needs and make it easier to start, track and complete data recovery projects regardless what other kinds of issues are on your plate. Our preparedness is legendary. You can start your job online at any time and rely on 24/7/365 support. We’ll pay for shipping, and if that doesn’t work, we’ll pick up your media personally. We’re vetted by major hardware manufacturers, so successful retrieval is far more likely. We maintain ISO Cleanroom, IACRB, PCI and SOC Type II certifications.